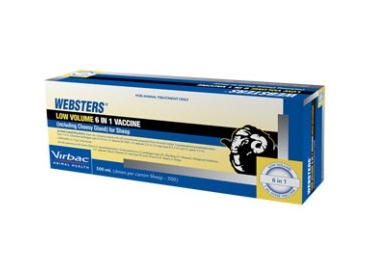 Virbac Animal Health’s extensive portfolio of vaccinations includes Websters low volume 6 in 1 vaccination for the treatment of cheesy gland and 5 different clostridial diseases in sheep. The 6 in 1 vaccination is available with or without selenium. The version with added selenium is only for use in areas that are deficient in natural selenium deposits. It helps with the prevention of unthriftiness and other selenium responsive conditions such as white muscle disease. Lambs should be vaccinated at marking with a 1ml dose. A second dose should be injected at weaning, 4 to 6 weeks later. The vaccination should be administered by subcutaneous injection. Wherever possible ewes should also be vaccinated 2 to 3 weeks before birthing. To maintain full immunity lambs and ewes should receive annual booster doses. There is no requirement for a withholding period required with this 6 in 1 vaccination. It is available in 200ml and should be refrigerated between 2°C and 8°C. For more information on the 6 in 1 vaccination against cheesy gland and clostridial diseases, or to find out more about similar livestock vaccinations, visit the Virbac Animal Health website.